The U.S. Supreme Court has let stand a Minnesota court decision that could pave the way for more expensive state judicial campaigns. The high court refused an appeal of a ruling that allows judges to campaign under political party endorsements, take part in political activities, and solicit campaign funds. Supporters say the ruling means the public will have newfound information about those seeking judgeships in the state. Opponents say they haven't given up the fight. Washington, DC — On the same day the Minnesota Supreme Court formally swore in its new chief justice and another associate justice, the landscape radically changed as to how justices will keep their seats. In Minnesota, the governor typically appoints a person to fill an open seat and then that person must run later for election. The U.S. Supreme Court's decision means judicial elections in Minnesota could look very different. For eight years, attorney Greg Wersal fought to get the courts to strike down the state's judicial ethics rules. Wersal says the changes will breathe new life into the state's legal system because many incumbents will lose their positions. "We've been gathering up a lot of dead wood in the judicial system and this will give us an opportunity to clear it out," he said. This is Wersal's second victory. Three years ago, the U.S. Supreme Court agreed with Wersal and the Republican Party to strike down a section of the state's Code of Judicial Conduct, that forbid candidates from speaking publicly on political and legal issues. But Wersal and the Republican Party sought more, and the latest ruling has delivered it. Political parties are gearing up to take advantage of the new rules. The Republican Party's Mark Drake says the party hopes to begin supporting judicial campaigns in time for November's elections. "You'll probably see endorsements of judicial candidates. We have changed our constitution and bylaws to allow for endorsement of judicial candidates. My understanding of it is the congressional districts will nominate someone and that will go up to the state convention and these people will be endorsed," said Drake. There's speculation that the driving force behind endorsing judicial candidates is to shift the courts on hot-button issues, including abortion. When asked about whether the Republican Party would look to endorse judicial candidates based on controversial issues, Drake said that would be left up to the local districts to decide. He said he didn't want to talk about any kind of litmus test. The issue was front and center in many of the state's top legal minds gathered at Russell Anderson's swearing-in ceremony as chief justice. Anderson has been outspoken about the need to keep politics out the legal system. "There are those who seek to inject large amounts of money into our system of selecting judges, and influence the election of judges and subsequent decisions of judges. I ask the people of Minnesota to join me in one unified response. And that is this: In Minnesota, justice is not for sale," Anderson said. 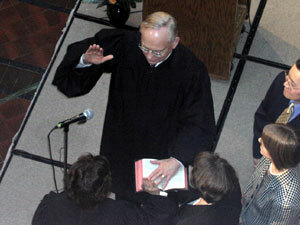 Before the ceremony, Chief Justice Anderson said the court is convening a bipartisan committee headed by former Gov. Al Quie to spur public debate on how Minnesota should elect judges. The effort, Anderson said, could mean amending Minnesota's Constitution. Gov. Pawlenty, who attended Anderson's swearing-in, said he hadn't seen the decision. He did say, however, he hopes candidates will show restraint. "I would hope that they would be measured and reasonable. Even if they're allowed to do it, doesn't mean they need to go out and do it and do it to the extreme," Pawlenty said. Wersal disputes Anderson and others' objection to the new rules. He says the rules aren't new; they're rooted in Minnesota's birth. "They're ignoring the Minnesota Constitution, which calls for free and open judicial elections. And they're wrong, based on history," said Wersal. "In the first 80 years of our state, judicial candidates were commonly endorsed by policitical parties. So we're not creating something new; we're simply putting Minnesota back where it was when our founders created this state." Although this particular legal battle is over, there is still the issue of attorneys' fees. The state will likely have to pay Wersal and other attorneys for eight years of legal wrangling. It's unknown how much those fees will total.